In 2018, Irish consumers will spend €8.2 billion on out of home food & beverage. Most consumer spending (approximately 91%) occurs in commercial segments, including quick service restaurants, hotels, coffee shops and cafes, full service restaurants and pubs. A lesser amount (approximately9%) is spent in the non-commercial segment, which includes business and industry, education and healthcare, among others. As the economy has grown, so too has the foodservice industry. Industry executives note that the strong growth in income and employment, coupled with strong tourism figures, have been key contributors to the overall health of the foodservice industry. This has been especially true in major cities such as Dublin and Cork, but additionally other parts of urban and rural Ireland appear to be performing at levels unseen in many years. 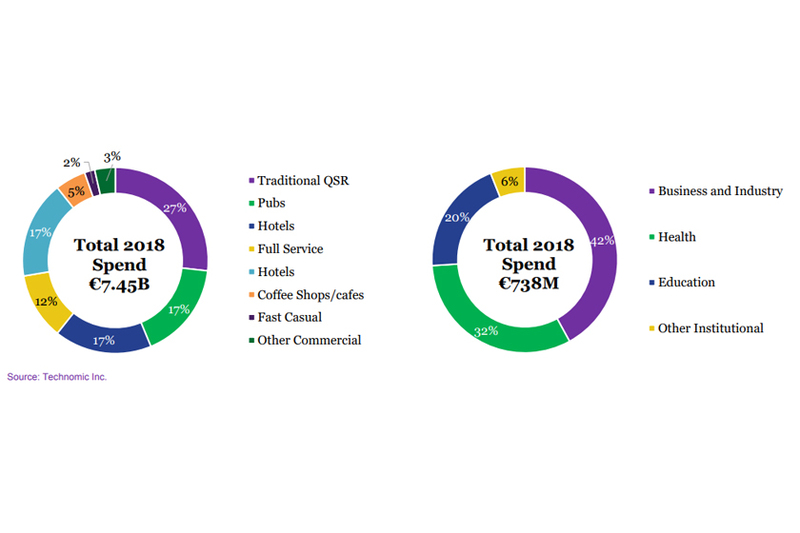 Overall growth from 2017 to 2018 in the Republic of Ireland for the total foodservice industry was 6.1% in total spending. Northern Ireland’s growth has traditionally been slower than the Republic of Ireland, but in 2018 the North has seen healthy growth. Taken in local currency (Sterling), Northern Ireland’s foodservice industry has grown 4%, with strong urban performance (particularly in Belfast which continues to benefit from investment and tourism growth). Nearly 40% (38%) of consumer spend in the Commercial channel is found in Limited Service Restaurants (LSRs), with 13% attributed to Full Service Restaurants (FSRs). Pubs account for 19% of Commercial foodservice spend (excluding alcohol). The fastest growing segment in the Commercial space are coffee shops (up 8.6% in ROI and 5.8% in stg£ in Northern Ireland) and hotels (up 8.6% in ROI and 6.1% in stg£ in NI). Within Institutional foodservice, growth remains lower than Commercial foodservice, but is still healthy. Business and Industry are the category leaders, accounting for 42% of the Institutional market. This is also the area seeing the highest growth, as tech firms continue to invest in their foodservice offer. Healthcare is also a large player in the field, with hospitals and other health facilities accounting for 32% of institutional consumer spend. Education rounds out institutional foodservice, with 20% market share. Other sectors, such as defence and prisons also contribute to institutional foodservice sales, though are not high growth drivers within the channel. Uncertainties and saturation mean slightly slower growth going forward. Expectations for the next three years are slightly lower (but still positive), the Republic of Ireland is forecasted to grow 4.7% in spending per year, while Northern Ireland is expected to grow 3.7% (as measured in Sterling). While current industry performance remains strong, all participants throughout the industry must understand the underlying dynamics and the longer term outlook for what will drive (or inhibit) growth going forward. 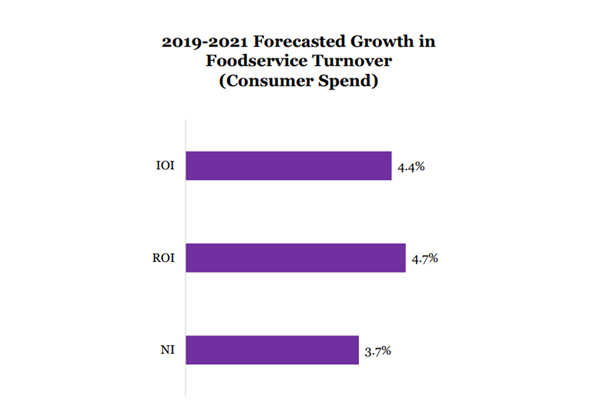 Throughout the research, there were a number of consistent themes emerging as critical strategic issues facing the Irish foodservice industry – each of these has key implications for industry players. These are explored in more detail in Section 6 of this report. We have also included a single page summary in advance of each Critical Strategic Issue, with supporting information that examines the drivers behind the issue and outlines recommendations for addressing and dealing with each issue. Despite the uncertainly around Brexit, it is clear that there will be a negative impact on the foodservice industry in one form or another. Contingency planning and developing strategic sourcing options is prudent. Packaging (particularly composable cups but also plastics) will likely be have a major change, and the industry must have options. This also includes packaging from the manufacturer to the operator; all types of packaging are under scrutiny. Nearly every major critical issue identified indicates that costs will continue to grow at a rapid pace. All parts of the industry must have a strong focus on maintaining and controlling costs. Maintaining a strong focus on costs does not mean that operators, distributors and manufacturers should not invest in their business. On the contrary, investing to establish and grow differentiation – through products, technology, valueadded services and the like –is more critical today than ever before. 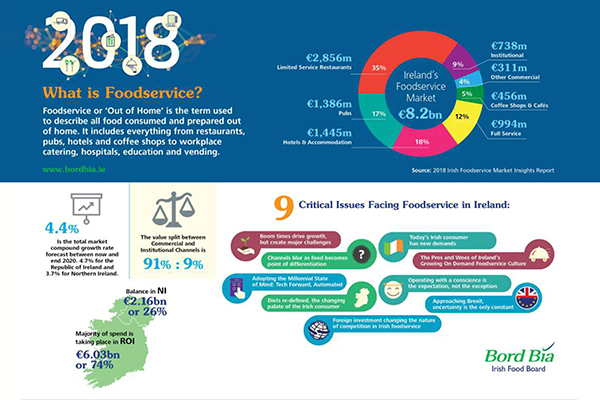 This research identified nine critical strategic issues that will continue to have long-term impacts on the Irish foodservice industry. These should be addressed within the strategic planning process to ensure that companies remain competitive and ahead of macrotrends shaping the industry in the years to come.